My name is Zane Ridings, and I have been blessed with the opportunity this summer to act as both a Short-Term Volunteer for Global Ministries, and as a representative of the CCIW in Guatemala this summer. This journey was made possible not only with the blessing of the region, but their financial support in purchasing tablet computers for the Kaqchikel (Ka-chi-kel) Seminary. I was also given financial support through Global Ministries, as well as from the Disciples Leadership Program (DLP). The Disciples Leadership Program is a full-tuition scholarship available for Disciples students interested in ministry or lay-leadership in the Christian Church (Disciples of Christ) after graduation. The DLP also provides money on two separate occasions during your time at Eureka to travel and explore ministry options. 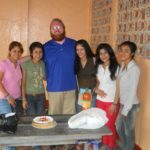 I spent my time in Guatemala in four different places, teaching an introduction to English class and learning Spanish as I went. 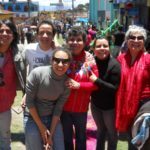 The immersion setting worked rather well for me, and it helped me learn to share with my host families and new friends more. They also liked helping the gringo out. On top of teaching and learning languages, I also had several opportunities to share with groups of youth and women, which was a very impactful experience for me, and I think gave them the chance to hear what an American thought about their situations. The nice thing is, that I was able to combine this time with some research and writing that I have been doing about liberation theology, which is a kind of progressive theology that is very common in Central America. So I was not only giving them an American view, but I was combining that with the extensive research that I have been doing about the country. There are a few quick things I would like to highlight about Guatemala. The first is that they have an extremely unequal distribution of wealth, much worse than Americas, with over 50 percent of their country being below the poverty line. They are also living in a near-police-state like environment, with injustices as Jean Wallace outlined in her article last week being a prime example. The illegal use of resistance against pacific manifestations, and the bending and breaking of national and global laws against the environment are two ways that the situation of San Rafael Los Flores has been severely mistreated. I am available for presentations to churches and groups of churches, and am especially open to youth groups. The focus of my trip was youth, and I also spent nearly a month in the home town of Glenda Lopez, the Guatemalan youth who was helping out at camps this summer. If you are curious about Guatemala, and/or would like me to speak or participate in a ministry of your congregation or group, please contact Zane Ridings at [email protected] or 503-798-7445.